Typically when I read a poetry collection that is more surreal in nature, I eventually reach some level of disappointment, simply for the reason that the collection lacks a form of balance between the concrete and the surreal. 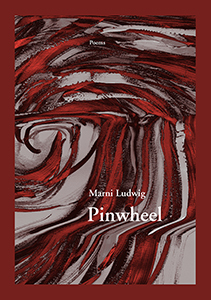 In Marni Ludwig’s collection, Pinwheel, however, I never reached this level of disappointment. Though the collection finds its home in the surreal and continues to be severely imagistic, there is a narrative arch woven in throughout that develops over time. In my mind, while there are a variety of directions the reader may take this narrative arch, I found my personal center in following the trek of a blind girl (or even, the concept of blindness) who reappears in several of the poems throughout. Within this arch, the poems were enticingly involved in the kinesthetic—the movement of horses, the body in dance, the body and mind’s relationship to nature, as well as the potential absence of a bodily sense: in this case, eye sight. In this way, while the poems continue to be somewhat inaccessible, these moments of doors closing are explained away through this lack of eye sight: surely the imagistic details, or the acts of a moving creature, may be confused or even transformed through being experienced by bodily senses other than that of eyesight. This gives the collection a special authenticity, in the way of exploring this variety of topics without the traditional context of the observer, followed by touch or taste; rather, the collection becomes hinged on these later senses and contains a freshness through that avenue. Extremely impressive, I really enjoyed Ludwig’s first full-length collection and am looking forward to reading more of her work in the future.